2/11/2003 News media contact: Kathy Gilbert · (615) 742-5470 · Nashville, Tenn. NOTE: Photographs are available with this report. NASHVILLE, Tenn. (UMNS) - Sounding at times like a preacher behind a pulpit, President George W. Bush urged participants at the National Religious Broadcasters' convention "to work hard to break down the barriers that have divided the children of God for too long." But in the end, it was the chief commanding officer of the United States who told the gathering that Iraqi dictator Saddam Hussein must be stopped to ensure peace for future generations. 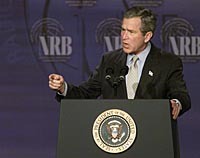 President Bush spoke Feb. 10 to thousands of religious broadcasters attending their annual convention in Nashville. In his 40-minute speech, he honored volunteers who mentor disadvantaged children, spoke about rallying the "armies of compassion" by supporting faith-based initiatives and ended with strong words about a looming war with Iraq. His remarks were often interrupted by long and loud applause, shouts of appreciation and standing ovations from the crowd. Gospel singer Michael W. Smith set the tone by opening with the song "Great is Thy Faithfulness." "This man (President Bush) has a heart for God," Smith said. "I will be the opening act for the president any day." The tone turned more patriotic with the showing of Smith's video "There She Stands," written about the American flag, followed by a rousing melody by singer Sara Paulson. The audience stood and applauded for several minutes once Bush stepped onto the platform. "For too long, some in government thought there was no room for faith-based groups to provide social services," Bush said. "I have a different point of view. I believe government should welcome faith-based groups as allies in the great work of renewing America." He said he has issued an executive order banning discrimination against faith-based charities, and he continues to work with Congress to enact faith-based legislation. He added that faith-based offices have been created in key Cabinet departments to ensure equal treatment and fair access to government funds. "Governments can and should support effective social services provided by religious people, so long as they work and as long as those services go to anyone in need, regardless of their faith," said the president, a United Methodist. "And when government gives that support, it is equally important that faith-based institutions should not be forced to change their character or compromise their prophetic role. "What I'm saying is, the days of discriminating against religious groups just because they're religious are coming to an end." Meetings are being held across the country to help faith-based groups understand how to qualify for government grants, he added. Bush also told the group he wants Congress to address the issues of disadvantaged children and people addicted to drugs and alcohol. "I asked Congress to support a mentoring proposal which will bring caring adults into the lives of more than a million children, disadvantaged children, including the children whose mom or dad may be in prison. There's no question in my mind that if this nation puts their mind to it, we can surround those little ones with love and provide a better hope for them. "I believe that we can take an approach that focuses on the addict, give that person a voucher to be redeemed at any program that he or she chooses - especially those programs that have got the capacity to change heart and, therefore, change habit." Bush called on religious broadcasters to appeal to their audiences to bring wealthy churches together with low-income congregations to serve the poor and needy. "It's been said that 11 a.m. on Sunday is the most segregated hour in America," he said. "We all have a responsibility to break down the barriers that divide us. In Scripture, God commands us to reach out to those who are different, to reconcile with each other, to lay down our lives in service to others. "So today I ask you to challenge your listeners to love somebody just like they'd like to be loved themselves; to remind them that one person can make a difference in somebody's life," he said. Turning from words of compassion and hope, Bush used the last moments of his speech to talk about the threat to peace from "an outlaw regime in Iraq that hates our country." "My attitude is that we owe it to future generations of Americans and citizens in freedom-loving countries to see to it that Mr. Saddam Hussein is disarmed," he said. Bush has been urging the United Nations to get tough with Iraq, charging that Saddam has violated U.N. orders to account for and destroy his weapons of mass destruction. "I take my responsibilities incredibly seriously about the commitment of troops," Bush said. "But should we need to use troops, for the sake of future generations of Americans, American troops will act in the honorable traditions of our military and in the highest moral traditions of our country. "As I said in my State of the Union, liberty is not America's gift to the world. Liberty is God's gift to every human being in the world. "America has great challenges; challenges at home and challenges abroad. We're called to extend the promise of this country into the lives of every citizen who lives here. We're called to defend our nation and to lead the world to peace, and we will meet both challenges with courage and with confidence." *Gilbert is a United Methodist News Service news writer in Nashville, Tenn.